When she was growing up in North Carolina in the '90s, Jennifer Boyce recalls the walls of her home were adorned with pictures of a grandfather she'd never met. On the bottom of a bookshelf was a photo album containing stills of her grandmother, another relative she'd never spoken to. "I didn't know why they weren't in our life," Boyce, now 30 years old, says. She started asking her mother questions, trying to piece together what had happened to her family. "Why was Grandma Jessie killed? How did she die? All I knew was that they were dead." Her grandfather, Sifroy Stewart, died in Montana in 1964, when he was 35 years old. Police told the family he'd gotten drunk and fallen asleep behind the rear wheels of a semitruck. Her mother was in her 20s when she learned from eyewitnesses a decade later that wasn't the full story—he'd been beaten up until he lost consciousness before the truck driver drove over his body. In 1981, her aunt, 24-year-old Pablita Stewart, was murdered by her husband. Three years later, her grandmother, Jessie American Bear, was shot and killed in Provo, Utah, by an ex-husband. Boyce begins to cry as she remembers her family's painful history. "This is really hard. But I want to share it because it is so necessary," she says through her tears, trying to maintain her composure. "And there are a lot of people that can't. Not yet." Boyce recalled all this recently at a discussion organized by the Diversity and Inclusion Center at Westminster College. She talked about her work as the committee chair of the Murdered and Missing Indigenous Women of Utah for PANDOS, the Peaceful Advocates for Native Dialogue and Organizing Support. "There is rarely a Native woman that you will find who doesn't know someone or is related to someone who is missing or who has gone missing," she said, underscoring that the murders were not isolated incidents within her family. Several of PANDOS' red, woman-shaped cutouts lay behind Boyce, remembrances that make concrete the nationwide crisis facing indigenous women and men. Of the three dozen names written on the figures, five are from Boyce's family. According to the Centers for Disease Control, murder is the third-leading cause of death among Native American women between ages 10 and 24. On some reservations, the death rate of Native women is 10 times the national average. Despite the staggering figures, data gathered from reservations does not account for acts of violence committed against indigenous people who live in cities, where some 71 percent of Native Americans reside. Researchers say this lack of urban data is a critical hole in their understanding of violence committed against Native peoples. Enter the Urban Indian Health Institute, a Seattle-based organization that recently released a groundbreaking report that attempts to gauge the number of missing and murdered indigenous women and LGBTQ individuals in 71 cities across the country. UIHI identified 506 unique cases— including 24 in Salt Lake City, putting it within the report's top 10. You can read the report here. Related Who's Missing? : How one local Native American-led activist group is giving a voice to their missing and murdered Indigenous sisters. Almost 80 percent of the disappearances and murders logged in UIHI's data have occurred since 2000, years after Boyce's grandparents were killed. Yet the violence continues. As of today, Boyce says she has one cousin who still is missing, and two whose killers have yet to be brought to justice. One of her cousins was murdered just last April. This report, Boyce told the Westminster College audience, is vital to understanding the ongoing epidemic. "It just doesn't stop." Each of the surveyed cities in the UIHI study either has an Urban Indian Center located within its boundaries or ranks highly on the Murdered and Missing Indigenous Women database, Annita Lucchesi, UIHI research fellow and one of the report's authors, says. In other words, all the locations from which UIHI gathered data had large populations of Native American residents, or had high rates of violence committed against indigenous women. The project's goal, Lucchesi says, "was to create numbers that have concrete stories attached to them, and numbers that, moving forward, are going to help us protect our women, rather than just scare our women." She hopes the report inspires better research and record-keeping so the public can better understand the scale of the violence. "There's so many numbers that just float around, but they float around with no context," she says. UIHI managed to identify 153 cases nationwide that weren't included in records obtained via Freedom of Information Act requests to law-enforcement agencies. Lucchesi theorizes that's because those compiling the report have a personal connection to its content. "I think it's notable that it was done by indigenous women ourselves," she says. "Because we're invested in the research in a way that others might not be." Of the 29 states surveyed, Utah had the eighth-highest number of murdered or missing indigenous women or LGBTQ individuals. Its capital city was the only part of the state that Lucchesi requested data from. The two dozen Salt Lake City cases cited in UIHI's report came from a FOIA request submitted to the Salt Lake City Police Department, Lucchesi says. Lucchesi suggests the city's high ranking could partially be due to the volume of information it provided to UIHI. "That's one of the reasons why Salt Lake City is prominent in the data: because police were thorough with providing us with whatever they could." After looking into UIHI's records request, Detective Greg Wilking drew a similar conclusion. "That speaks to our desire to be open and transparent, to provide that data," he says. But he also isn't sure the report is accurate. "I find their data to be really, really misleading." Pulling up the information SLCPD sent to UIHI, Wilking says police listed 22 deaths between 2008 and 2018. And that number isn't entirely reflective of murders: only six cases were homicides. Four were "attended deaths," essentially dying of natural causes as indicated by a medical professional, and 12 were "unattended deaths," when someone's deaths occurs in the absence of medical care or without a witness. "I think there's validity to what they're saying, that this is an endangered population in terms of being vulnerable," Wilking says, "but I struggle with what they presented." Wilking also questions the reporting because his city was the only one surveyed in Utah. "If they're saying we're the ninth worst in Salt Lake City, but you haven't collected any data from Ogden ... then how can you really say we're the worst if there's no information coming out of them?" Wilking asks, choosing a Utah city at random. "There were a bunch they didn't even get data from." More than 2,200 Native Americans were living in Salt Lake City in 2017, according to the U.S. Census website, a fraction of the more than 46,000 Native residents statewide. Next year, Lucchesi plans on filing information requests from county sheriffs across the U.S. She also has submitted requests to state agencies nationwide for MMIW data, but not all states are willing to cooperate. A few requests have been filled, others have been rejected and some are pending. There's hope that the federal government will step in where the states won't. Last month, the U.S. Senate Committee on Indian Affairs voted unanimously to pass Savanna's Act, which would require the Justice Department to publish an annual report on the number of murdered and missing indigenous women in the U.S. But that centralized database wasn't available at the time of UIHI's study. Lucchesi rejects the idea that the report was singling out particular cities. "This isn't about cherry-picking jurisdictions and not holding people accountable," she says. "It has not been easy to access this data from state-level agencies, or the FBI for that matter." Moroni Benally and Yolanda Francisco-Nez share a crowded second-floor office in Sandy. They're both staff members of Restoring Ancestral Winds, an organization whose mission is to "support healing in our indigenous communities." In that vein, RAW is meeting with police departments and tribal leaders across the state, to discuss the report. Benally says the group also is working with state legislators to raise awareness and create a statewide database that tracks the number of murdered and missing Native Americans. Benally says the study's numbers were jarring, especially those from Salt Lake City. But once the report came out, he and his colleagues started talking about how many people they know who have been murdered or gone missing. "'My friend this, my cousin that,'" Benally says. "And other people had their own list, and we're like, 'Oh my God.'" Perusing social media, Benally says he sees posts every few days about another woman who has gone missing—a grim constant whose frequency has become white noise. "We've been experiencing this in our communities for so long that it's just kind of become normal." RAW presented the report's conclusions and implications at a tribal leaders' meeting last month near the Goshute Reservation in West Wendover. "They were pretty shocked, as well. They knew that people were going missing in their communities, their families, but they just didn't realize the rate at which it was happening," Benally says. "We've all been affected." Having worked in three different Salt Lake City mayors' offices over 17 years, Francisco-Nez has an insider's understanding of the challenges and risks living in the city poses to its Native American residents. Moving from a reservation to a big city to start a new life or attend college could require people to build a new support system or overcome language barriers, difficult objectives to complete if they can't secure fundamental needs like affordable housing or medical care. "Being able to navigate through those systems can be really challenging for someone who's never lived in a city," she says. High levels of homelessness and the impending closure of The Road Home further raise the possibility of victimization, Francisco-Nez suggests, as does human trafficking within the city and state. "We have a major corridor going through this valley," she says of Interstate 15 and a truck stop off 2100 South, locations she says are hotspots for human trafficking. The report's conclusions aside, UIHI notes that its numbers are likely undercounted, given the lack of consistent data collection, law enforcement agencies' racial misclassifications of missing or murdered women, and a dearth of national and international media coverage. Benally and Francisco-Nez agree the numbers likely don't represent all cases in the 71 cities mentioned in the study, let alone the thousands of communities that weren't surveyed. "I'm so convinced there's an undercount because of what I hear in the Native community," Francisco-Nez says. Benally agrees, "but even with the numbers that we have, it's still quite shocking." Every Thursday afternoon, the American Indian Student Leadership group at Salt Lake Community College meets in the student center in the school's South Salt Lake campus. Poring over a printout of the UIHI report, club member Ericka Norton thinks about her 20- and 23-year-old daughters. The 43-year-old mother feels safe on the SLCC campus, but she worries about her child who attends the University of Utah. Norton feels less safe within the city limits than in its surrounding suburbs. "It does raise a red flag for me to feel like I have to watch my girls closely," Norton says. "It's an alarming thing for me." Club vice president Joey Du Shane says raising awareness of missing and murdered indigenous women and LGBTQ individuals is important in light of what he sees as a lack of journalistic coverage on substantive Native topics like Bears Ears National Monument and local tribe issues. "It's usually swept under the rug. Like, no one cares about their problems, and I think that is a part of that, too," he says. Joey's twin brother, Joseph Du Shane, is the group's president. Usually, their meetings revolve around planning or attending community events, or brainstorming how to share Native traditions with the SLCC student body. With the report's release, their meetings' tone has taken a somber turn, as members discussed its importance and implications. "Some of this stuff hits home for us," Joseph says. The Du Shane brothers grew up in Fort Duchesne's Uintah and Ouray Indian Reservation, a community where Joseph says domestic violence is common. In 2016, the boys' cousin's girlfriend was murdered at an apartment complex in Taylorsville. "It was a big event for me and our family, and I'm glad the police were able to catch the perpetrator, but also this report kind of shakes that confidence in police efficiency to file and get that information correctly into the system, and not get lost or get swept under the rug," Joseph says. "It's nerve-wracking it has a connection to this report. And also I'm pretty sure if they spread it through[out Utah cities,] because they only did Salt Lake City, they would find even more shocking results." RAW is working to better understand the concerns of families like the Du Shanes. The nonprofit is collecting qualitative data from focus groups across the state, to get a sense of Native women and LGBTQ community members' sense of safety. 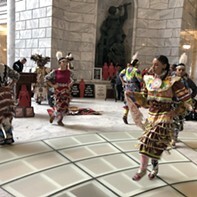 As far as Benally knows, it will be the first statewide assessment to gauge the prevalence of violence against Native women and the Native LGBTQ community in Utah. "At this point we just know that there is a problem, and we know that there's city and state policy and legal structures that may be implicated," he says. "There might be informal cultural norms that might be implicated, but we don't know, and so this is why we're doing this large assessment to figure out exactly what's kind of at the center of all of this." Research is preliminary, but the few participants they've thus far engaged have brought up complex concepts and concerns, like stigma, shame and spirituality. "What we're finding from that first focus group is there are lots of different agencies that may not know what's happening," Benally says. "And there are communities that may know it's happening, but are complicit in silencing or covering up what is going on." The results should be released sometime in spring 2019. In the meantime, Francisco-Nez encourages Utahns to read the report and become familiar with organizations that support Native American communities. Also vital is civic engagement during government meetings. When there's an opportunity to make a public comment, bring up the report. "I think we need to get that awareness out to leadership," she says. "The objective is not only to be aware and informed, but also to begin identifying some public funding to address this issue." Boyce's family history wasn't the only part of the Westminster panel. Students also conversed about the role of privilege in white Americans' understandings of U.S. history. Before concluding the talk, Boyce took back the mic and left the young people with a few parting thoughts. "We can continue this conversation beyond this room. Because that is what needs to happen," she said. "This needs to be cared about before we can try and get a huge database or legislation overnight to fix the problem. We have to want to fix it first." After stepping down from the podium, Boyce told City Weekly this sort of outreach is critical to MMIW's work. Bridges must be built so that vulnerable members of an already-historically exploited group can be protected. "We can't do everything on our own, with just Natives working on this," Boyce said. "It needs to stop. In order for something to stop, you have to at least know about it, or know that it's happening." Conversations like the one at Westminster College are an important part of both the healing process and in stopping the scourge, Boyce says. The stakes are high—violence against women has global economic consequences, to say nothing of the moral imperative of alleviating the tribulations of millions of people. "Unless we start addressing this issue or accepting the fact that is an issue, then we will reap the consequences of being complicit," Boyce says. "It will come back to us in some way or another." Boyce thinks it can be difficult for people to grasp the enormity and scale of such violence and suffering—she says it's tough for people who aren't Native American to accept such horror is a reality for many people living in cities and reservations throughout the U.S. "It's a big ask," she says, but merely acknowledging this violence means a lot. "Every time someone has said, 'Wow that's hard, that's a hard thing,'" they accept that it's true. That actually takes some of the weight off my shoulders. That makes it lighter." Growing up in a family where multiple members were killed over a 50-year period, Boyce strives to both honor her ancestors' memories and protect their descendants ... and herself. "There's always the chance it could be you. Or it could be a close relative. Another one." In supporting the relatives of murdered and missing indigenous women, Boyce is both making visible Native victims lost to history and processing her own family's grief. The trauma of unsolved, unspeakable crimes leaves a stain on future generations' lives as they try to make sense of past atrocities while coping with the knowledge that little has been done to stop the bleeding—families and friends are still joining their long-suffering ranks as more and more women go missing. It's dark, draining, emotional work, but it also gives Boyce a link to a past she never knew. "I can't explain it, but I have connections with my grandmother and my auntie," she says. "I have this weight that I carry. And there's still no justice."